The Prague Dependency Treebank 3.5 is a 2018 edition of the core Prague Dependency Treebank (PDT). It contains all PDT annotation made at the Institute of Formal and Applied Linguistics under various projects between 1996 and 2018 on the original texts. There are other members of the "family" of the Prague Dependency Treebanks, available separately and described elsewhere; search for "Prague Dependency Treebank" in the LINDAT/CLARIN repository. For more information about this version of the treebank, see below for a changelog and a download link and the menu tabs above for the description of data, available documentation, credits and support acknowledgements. Sarančata jsou doposud ve stadiu larev a pohybují se pouze lezením. V tomto období je účinné bojovat proti nim chemickými postřiky, ale dožívající družstva ani soukromí rolníci nemají na jejich nákup potřebné prostředky. 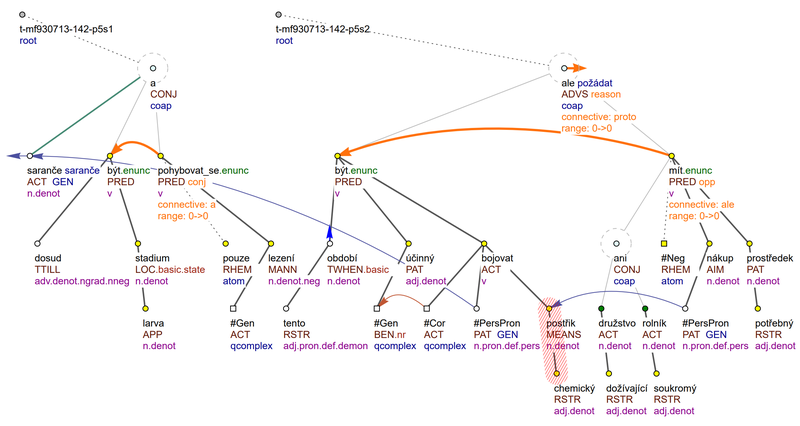 Example sentences from PDT 3.5, with tectogrammatical annotation including coreference links (blue and brown arrows), MWEs (red stripes) and discourse annotation (orange arrows and attributes/lables). Lit. : Grasshoppers are still in the larvae stadium, crawling only. At this time of the year, it is efficient to fight them using chemicals, but neither the ailing cooperatives nor private farmers can afford them.